July Class III milk and component prices were announced August 5. Class III milk prices set an all time record at $21.39/cwt. 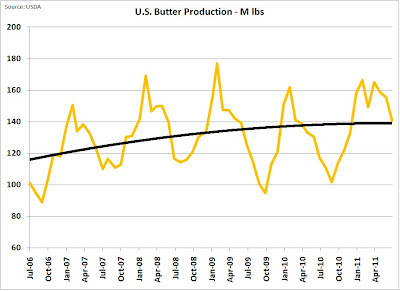 This was driven by a huge leap in milk protein prices to $3.83/lb. Even though there are a few indicators in the red on the dashboard, the leap in July protein prices makes up for any negatives. 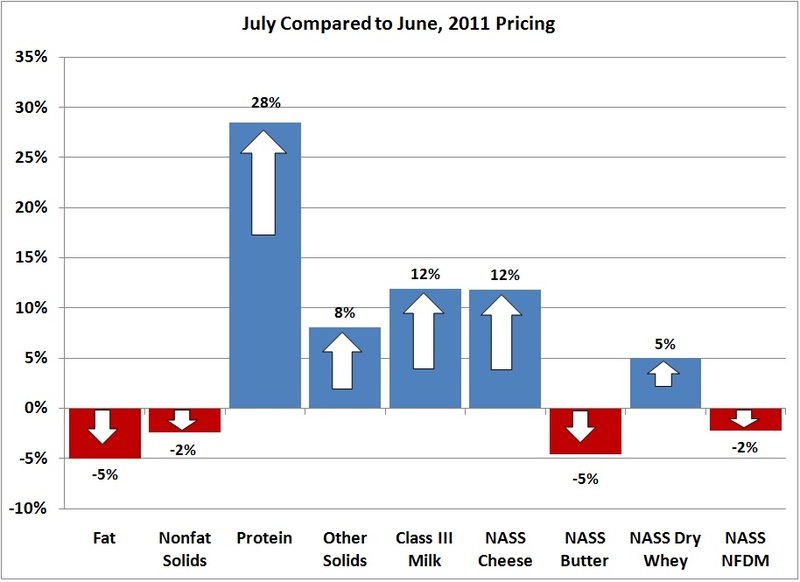 Protein increased from $2.98/lb in June to $3.82 in July, a 28% increase. 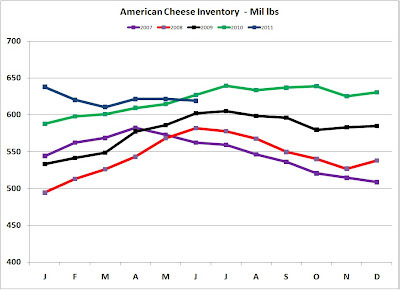 This was based on very strong cheese prices as will be analyzed later. $3.82 is not a record for protein, but when combined with strong butterfat and nonfat dry milk prices, a record Class III milk price was achieved. 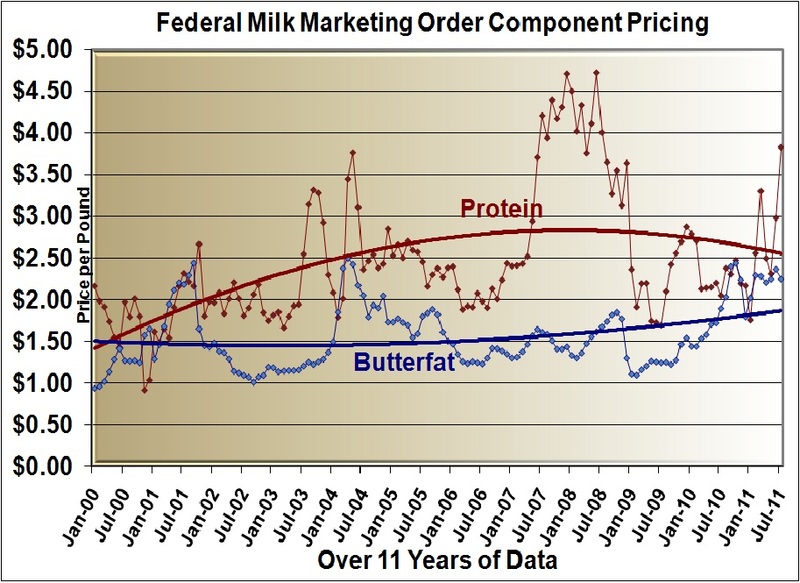 The record high for protein was $4.72 in June, 2008. 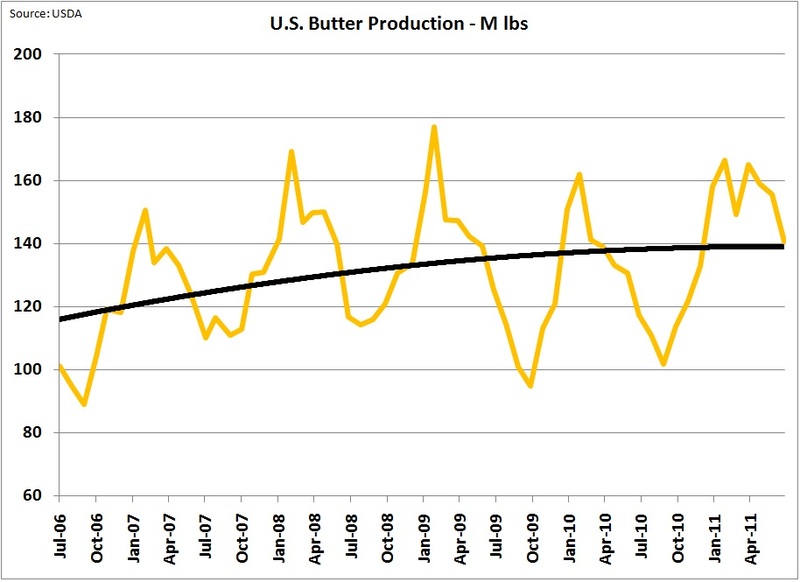 However, butterfat was at $1.61/lb at that time compared to $2.25 currently, and other solids were worth $.08/lb compared to $.36 currently. None of the component prices were records individually, but they were all good enough to cumulatively make the Class III milk price a record. 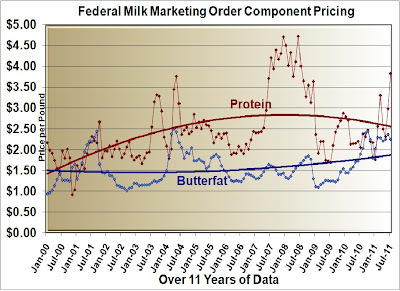 As analyzed below, strong prices should remain at least for the rest of 2011. That does not mean that there is no risk. The risk factors have to do with a possible decline in domestic consumption and a possible decline in exports. 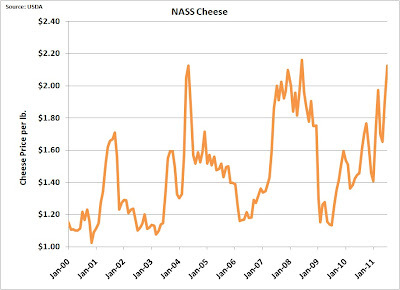 When cheese prices last reached record highs, domestic consumption did decline. 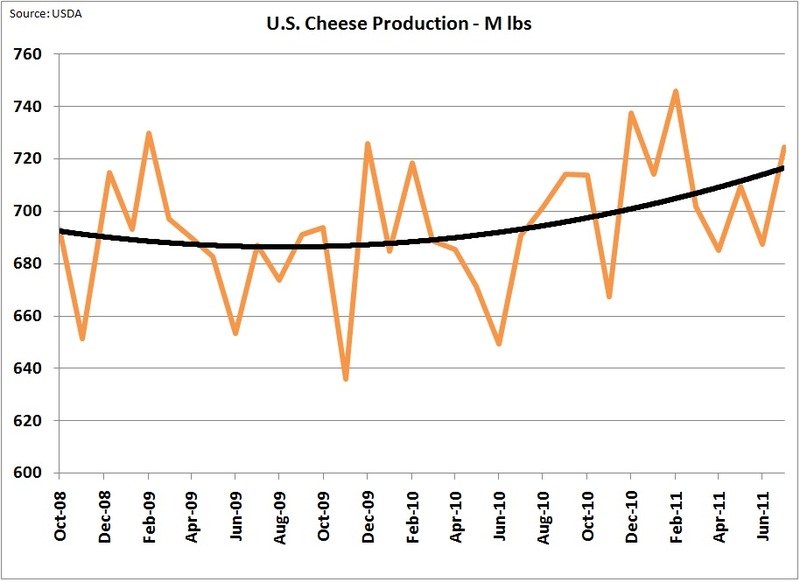 In 2008, when cheese prices hit a high of $2.16/lb and stayed high for nearly 12 months, consumption did take a dip. 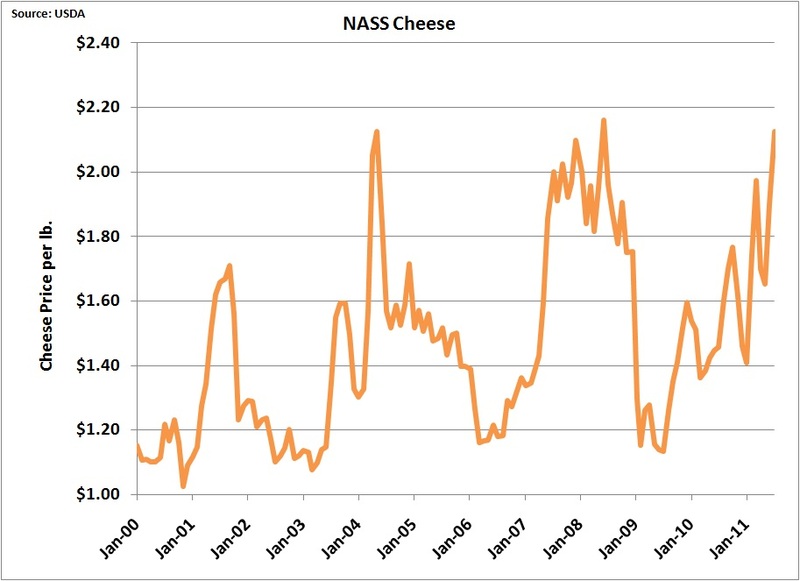 Cheese prices simply reached a point where less cheese was affordable. 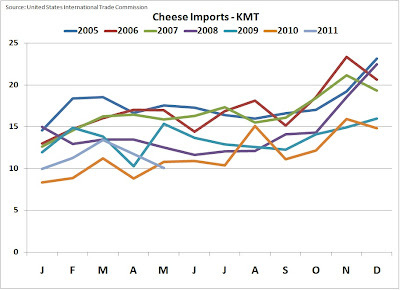 The high 2008 prices and resulting dip in consumption proved that there is price elasticity of demand for cheese. 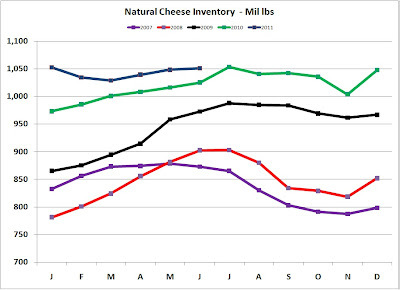 The current $2.12/lb price is very close to the 2008 price. 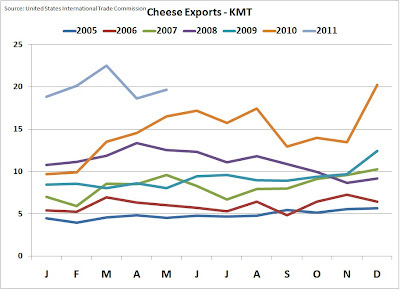 The risk to our booming cheese export business is tied to currency exchanges and world economic strength. 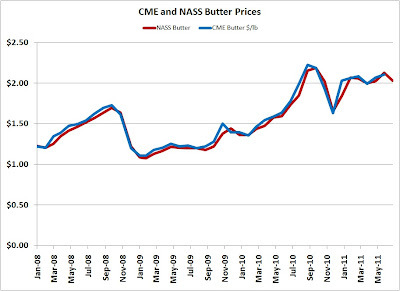 The USD has been weak compared to the New Zealand dollar and other currencies, making U.S. dairy products less expensive on the global market. 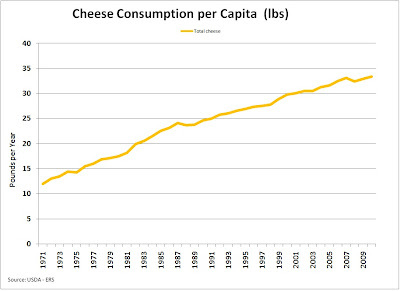 Also, world economies have been recovering so more people can afford cheese in their diets. Unfortunately, the current economic climate has a lot of uncertainty which creates a risk to the favorable economic environment we have been experiencing. Cheese fundamentals remain very strong. 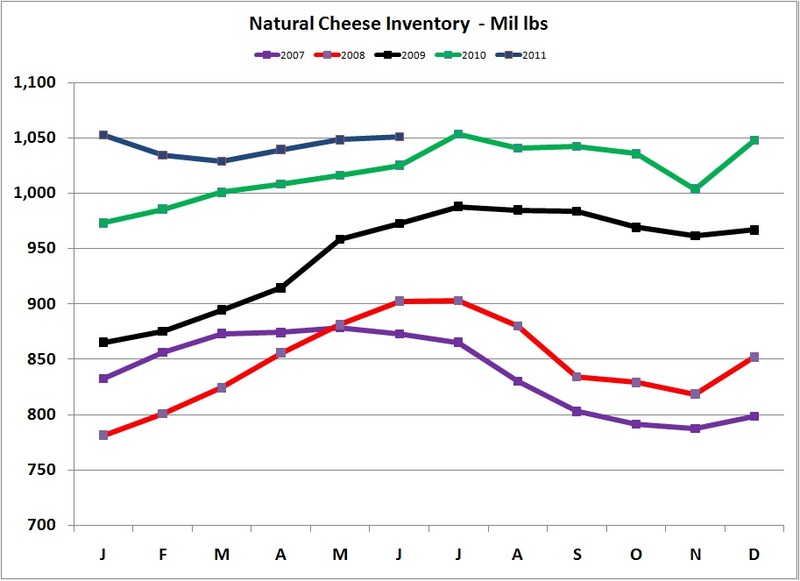 Inventories of cheese are not increasing and may even be decreasing a little. There appears to be enough inventory to satisfy demand, but not too much that would suggest falling prices. 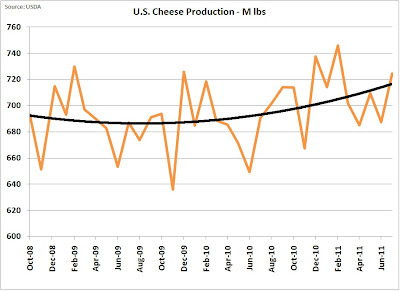 Cheese production is reasonably strong, but not too strong. 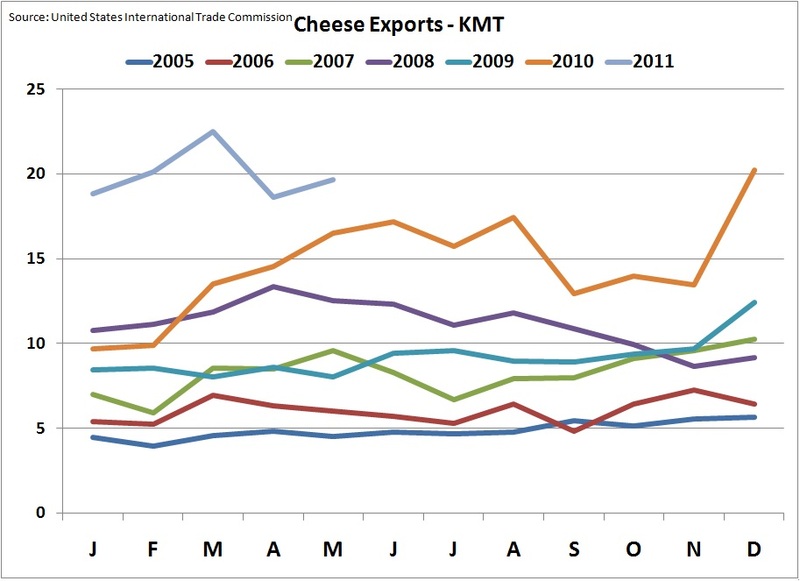 Cheese exports remain at record highs and cheese imports are at record lows for this time of the year. However, neither exports nor imports are outlandishly high or low. The data for exports and imports is not available until nearly two months after the close of a month, but the data through May looks encouraging. In summary, the cheese fundamentals look extremely good. There is good reason to expect continued high cheese prices. This is very important as cheese prices are the most important parameter for Class III milk prices. 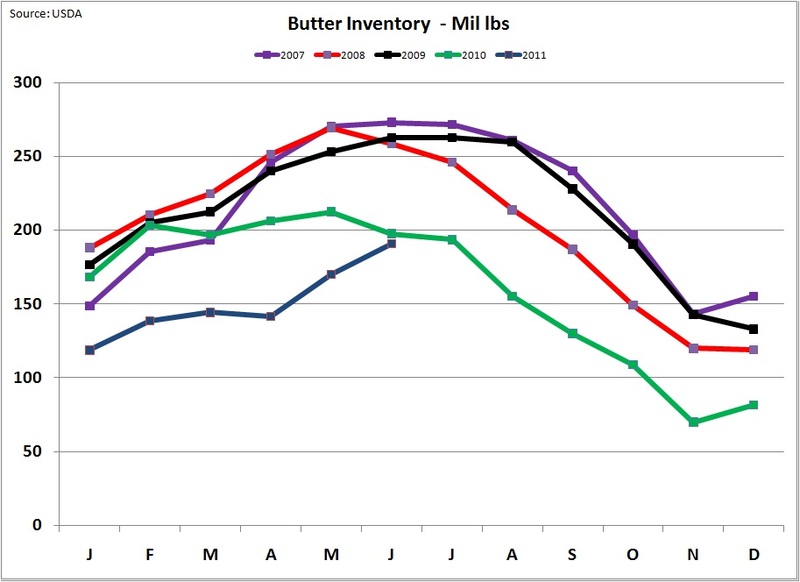 Previous posts to this blog have suggested that butterfat prices will fall to more normal levels. of around $1.50/lb. This has not happened. Butterfat prices remained firm in July at $2.25/lb. However, the fundamentals still show that some softening can be expected. 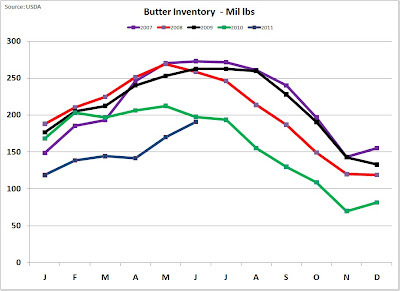 Inventories, while still very low, are in recovery and butter production remains strong. The increase in demand is driven by strong exports. 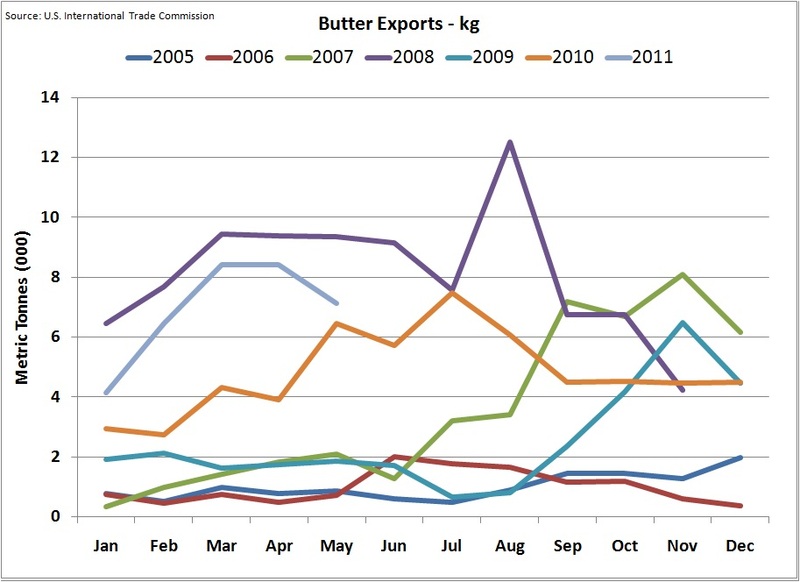 Through May, butter exports remain strong, slightly ahead of last year's exports. Domestic consumption continues to be extremely flat. 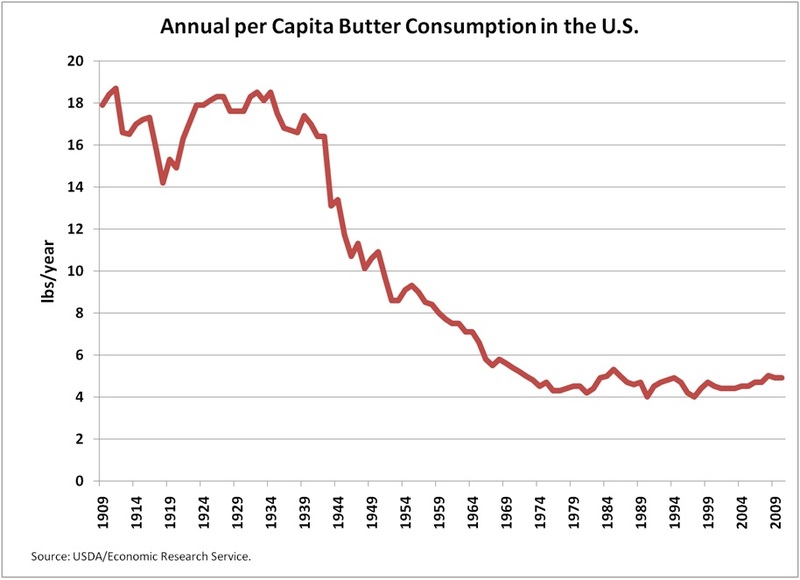 After a big consumption drop between 1940 and 1970, per capita consumption of butter has remained stable for the last 40 years. There is no reason to expect any change to this long term trend. 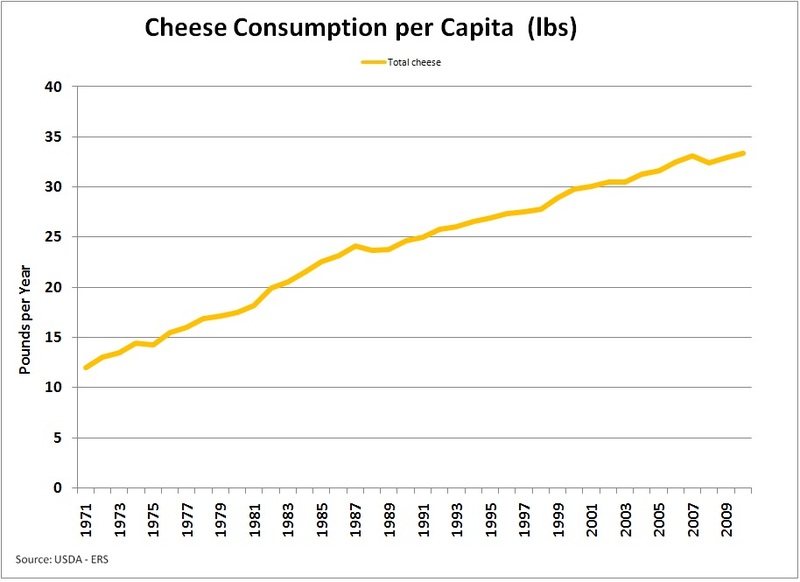 In closing, it seems appropriate to remember that the future of the U.S dairy business is very much tied to cheese. 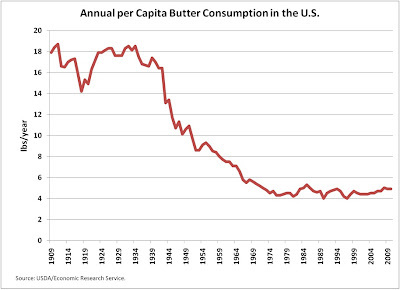 Cheese consumption continues to increase and butter consumption is stable. 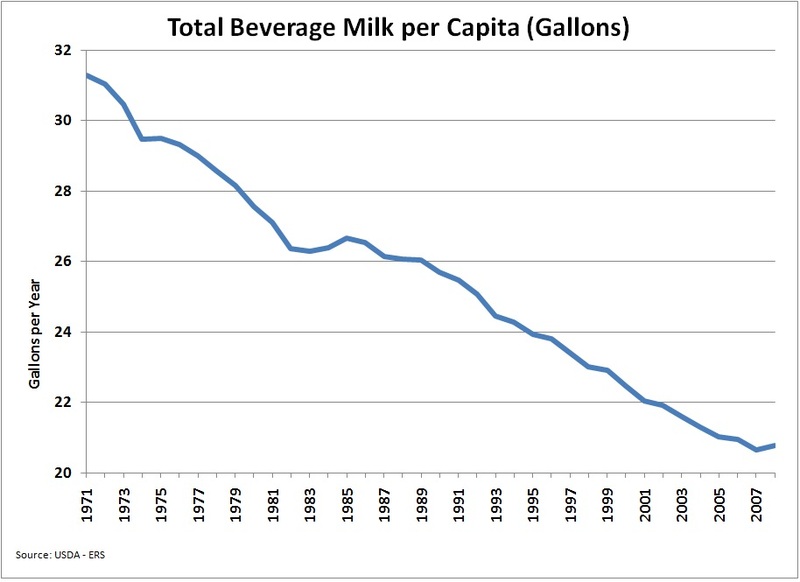 However, fluid milk consumption continues to decline in spite of some strong marketing programs. The USDA is behind in updating fluid milk consumption so the available data is only through 2009. However, a 50 year trend is a pretty strong trend. There seems to be no end to new competing beverages. 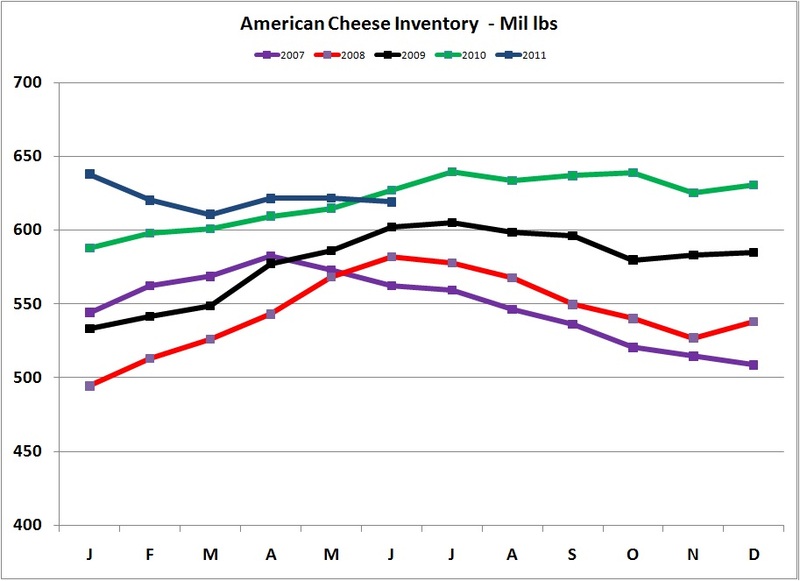 The U.S. lifestyle is very affluent and with affluence comes a trend for more cheese and less fluid milk. We need to remember that the dairy business is really "all about cheese".